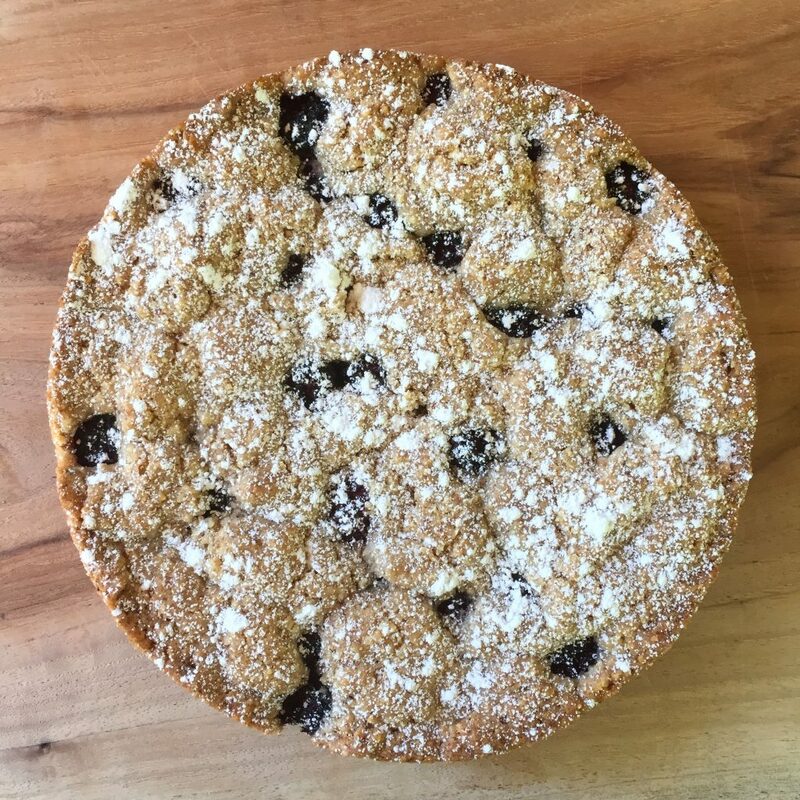 This rustic almond cake transports me back to my time in Italy where my husband and I enjoyed a luscious desert at a family run trattoria. It was such a simple cake but it was so moist and so full of flavor that I can still taste it in my dreams. I wish at the time I had the courage to ask for the recipe but alas I did not. 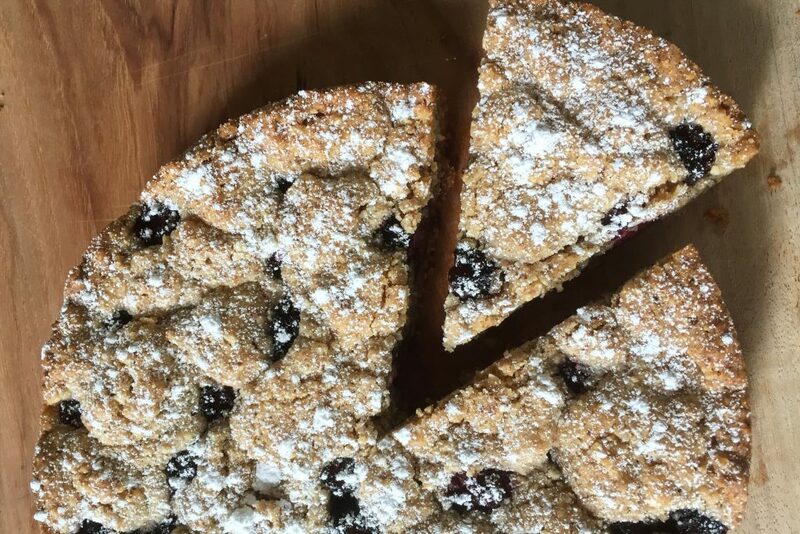 Therefore when I returned home, I had no choice but to scour through countless Italian cookbooks in a quest to recreate this Italian almond cake baked with fresh berries. Of course, I did not find the exact recipe, but I did find a one in Ursula Ferrigno’s book “La Dolce Vita” that was close. What you will find here is a loose adaption of her recipe. One of the differences is that with the original, the quantities are given by weight. This is actually an excellent way to write a recipe for baked goods, as the quantities will be more exact. But in America, recipes tend to be written for volume and not everyone has a kitchen scale, so I tried my best to work out the measurements as close as possible. Look over the recipe and you will see that it is really very simple and can be mixed together and into the oven in about 20 minutes. 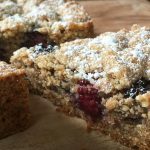 The ingredients are familiar ingredients that you usually use to make a cake with the possible exception of the ground almonds. The almonds are key to this recipe. They not only give the cake the flavor that I was looking for, but also the texture that made this cake so memorable. Almonds are found often in Italian baking and this little cake will have you daydreaming of a trip to the Italian countryside. Lightly butter and flour an 8 inch spring form pan. Add in the sugar beat for another 2 minutes. Add in the egg and the vanilla and beat until well incorporated. In a separate bowl, whisk together the flour, baking powder, cinnamon and the salt. Add the flour mixture to the batter and mix just until incorporated, followed by the ground almonds. The cake "batter" will be more like a cookie dough. Spoon about 2/3 of the dough into the spring form pan and spread it out evenly. 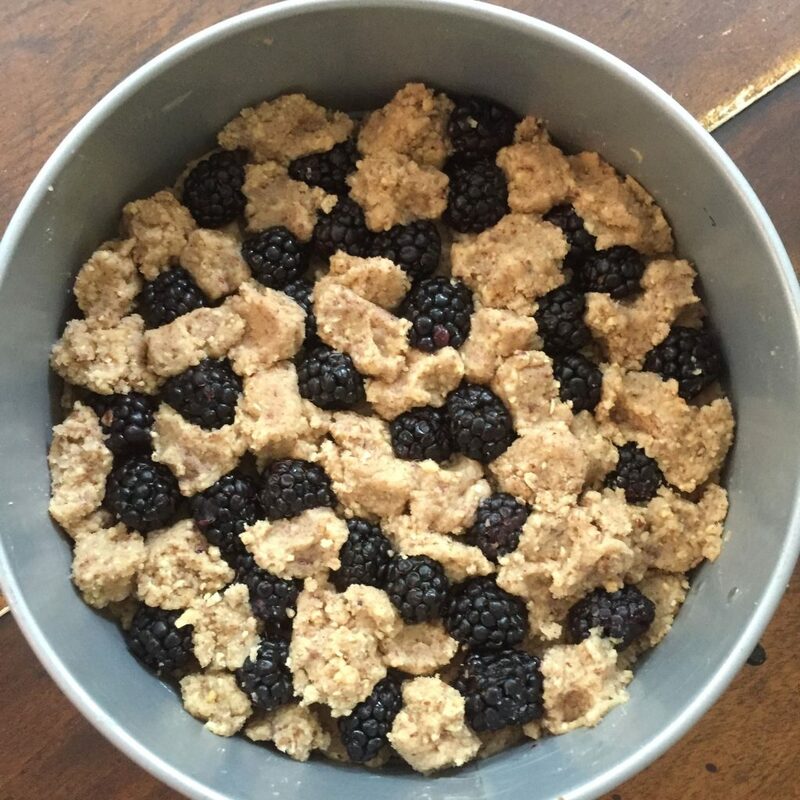 Arrange the blackberries on top of the dough. Then take small pieces of the remaining dough and place around the berries. It does not have to be perfect. 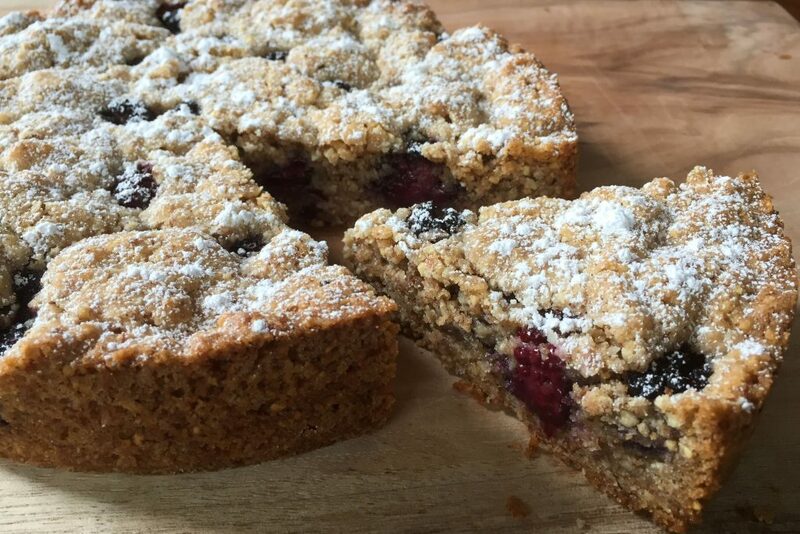 Bake for about 45 minutes or until a cake tester shows a few moist crumbs. Let the cake cool in the pan, unlatched. Remove the cake from the pan and place on a board. Sift a little confectionery sugar on top. Serve with tea or coffee. To make ground almonds for the cake: Weigh out 5 oz. of sliced almonds and put them into the bowl of a food processor. 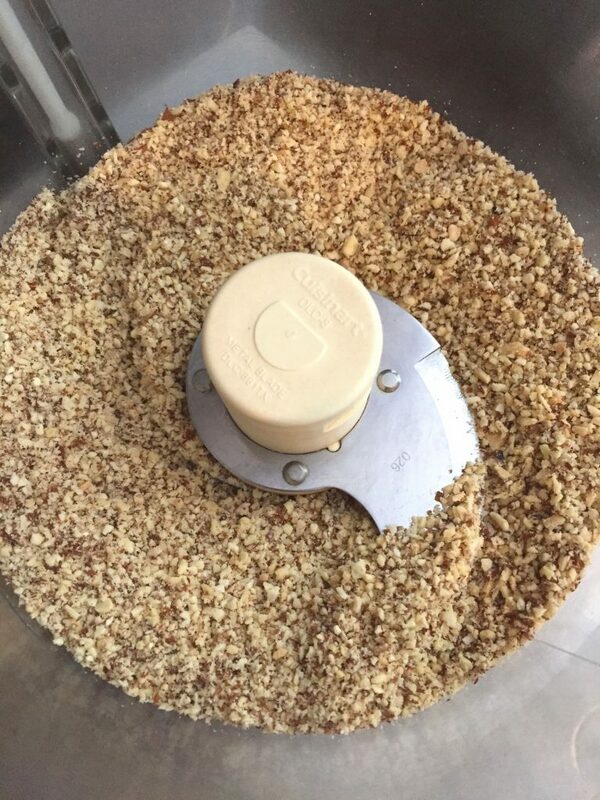 Process in short bursts until the almonds are finely ground. Avoid over processing or the almonds may turn to a paste. You can substitute the blackberries with raspberries or blueberries if you prefer. You can use a 8" round cake pan instead of the spring form pan. I would line the bottom of it with some parchment paper for easy removal.